Who is your real life hero? Show support for friends and family members who have a daily battle with MS whenever you wear this MS awareness t-shirt. This would look perfect at your next walk or fundraising event. 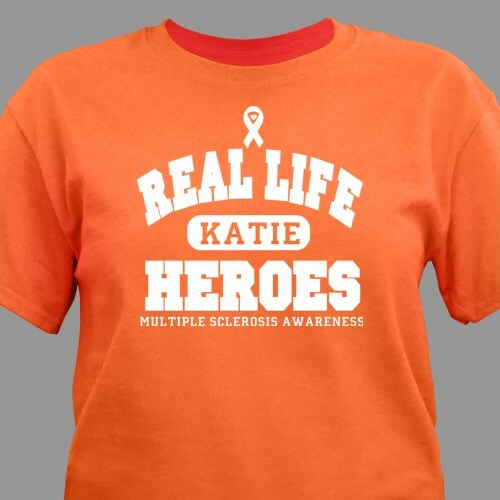 Our MS shirts are printed on premium 100% cotton t-shirts, machine washable in youth sizes XS-L & adult sizes S-3XL. Free personalization of any name is included. Great color & shipped within a timely manner! Didn't care for t-shirts I received last year but this shirt is much better! Very Pleased! received on time, exactly how I ordered it. very pleased overall. will order again next time I need something like this..
Additional Info Check out our line of Real Life Hero MS Awareness apparel right here at MyWalkGear.com. Great for wearing at your next fundraising event or on the go, one thing is certain: you'll be supporting your friends and family members who are battling this disease.